In The Studios we offer high-end iMac & Dell Precision computers, multimedia production equipment, software, and a variety of production rooms. All rooms in the Studios are available to NAU and CCC faculty, staff, and students and can be reserved for a maximum of two hours per day. Designed for practicing and perfecting your presentations in a classroom setting, the practice and presentation studio (Room 131) can accommodate from 4 to 30 people. Additional equipment available at the Ask Us! desk. 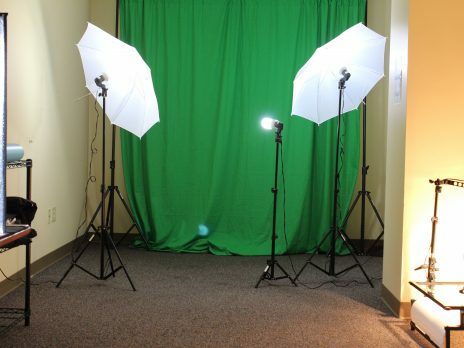 The three production studios (Rooms 137, 143 & 144) are available for individuals or small groups to work on multimedia projects from concept to publication. The production studios offer many industry standard applications, including the Adobe Creative Cloud 2018, Final Cut Pro X, and Pro Tools Express. The VR Learning Studio is a place to learn and explore in immersive environments using the latest virtual reality technologies. Theater quality audio and ambient LED lighting create a stunning experience for VR users and spectators alike! In the photography studio (Room 142), individual students or groups of up to 6 people can shoot portrait or still life photography using one of our three lighting stations. The One Button Studio is a simplified video recording setup that can be used without any previous video production experience. 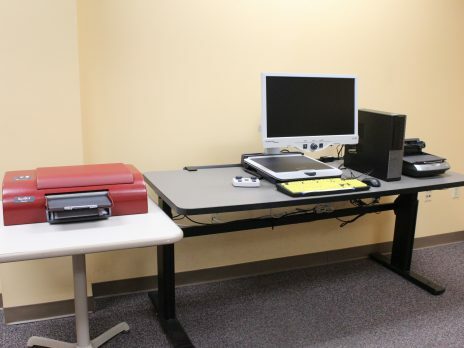 The assistive technology area of the Studios offers technology that helps make computing accessible to everyone. The technology accommodates one user at a time.